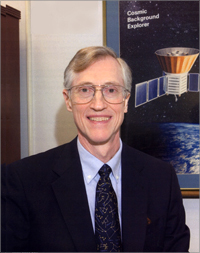 John C. Mather is Project Scientist, James Webb Space Telescope, Goddard Space Flight Center, National Aeronautics and Space Administration (1995-present). His research interests include cosmic background radiation and infrared spectroscopy. August 7, 1946Birth, Roanoke (Va.). 1968Obtained BA, Swarthmore College, Swarthmore (Pa.). 1974Obtained PhD in Physics, University of California, Berkeley, Berkeley (Calif.). 1974 – presentNational Research Council (NRC) Fellow in Astrophysics (1974-1976); Study Scientist, Far IR Absolute Spectrophotometer (FIRAS), Cosmic Background Explorer (COBE) (1976-1988); Project Scientist, Far IR Absolute Spectrophotometer (FIRAS), Cosmic Background Explorer (COBE) (1988-1998); Senior Astrophysicist (1993-present); and Project Scientist, James Webb Space Telescope (1995-present), Goddard Space Flight Center, National Aeronautics and Space Administration (NASA), Greenbelt (Md.). 1992 – presentAdjunct Professor of Physics, University of Maryland. 2006Awarded Nobel Prize in Physics with George Smoot "for their discovery of the blackbody form and anisotropy of the cosmic microwave background radiation". 2007 – 2008Chief Scientist, Science Mission Directorate, NASA Headquarters, National Aeronautics and Space Administration (NASA). Advised by Mather at NASA Goddard Space Flight Center. PhD advisor at University of California, Berkeley, "Far infrared spectrometry of the cosmic background radiation." National Research Council (NRC) Fellow in Astrophysics; Study Scientist, Far IR Absolute Spectrophotometer (FIRAS), Cosmic Background Explorer (COBE); Project Scientist, Far IR Absolute Spectrophotometer (FIRAS), Cosmic Background Explorer (COBE); Senior Astrophysicist; and Project Scientist, James Webb Space Telescope. National Research Council (NRC) Fellow in Astrophysics, Goddard Institute for Space Studies; Study Scientist, Far IR Absolute Spectrophotometer (FIRAS), Cosmic Background Explorer (COBE), Goddard Space Flight Center; Project Scientist, Far IR Absolute Spectrophotometer (FIRAS), Cosmic Background Explorer (COBE), Goddard Space Flight Center; Project Scientist, James Webb Space Telescope, Goddard Space Flight Center; and Chief Scientist, Science Mission Directorate, NASA Headquarters. Obtained PhD in Physics (1974). John C. Mather Nobel Prize autobiography. The very first light : the true inside story of the scientific journey back to the dawn of the universe / John C. Mather and John Boslough.